For grocery store runs, dropping the kids off at school and the daily commute - and especially for the times when you've got to do all three at once - the 2018 Toyota Highlander can keep up with your busy family. Not even the well-appointed Hyundai Santa Fe can match the Highlander for fuel efficiency, interior comfort and safety features. A family vehicle must be rugged, reliable and efficient, and Toyota has designed the 2018 Highlander to be all this and more. Keep reading, or browse all our model comparison pages to see how the 2018 Toyota Highlander compares with rest of the competition. Then head down to our Salem dealership location for a test drive - but not before you check out our new car specials and see if we're offering a special rate this month on a brand-new Highlander! 44.2" / 40.7" Front Seat Legroom / Headroom 41.3" / 39.9"
With a bigger rear cargo area than the Santa Fe, the 2018 Toyota Highlander is ready to carry your entire grocery store run. You'll be more comfortable along the way, too, with a roomier front seat than you get in the 2018 Hyundai Santa Fe. And if you simply need to fit more people, the 3-passenger second and third rows in the Highlander mean you can seat up to 8. 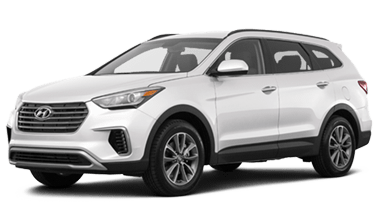 The 2018 Hyundai Santa Fe can only seat 7. When you upgrade to the impressive 3.5L V6 engine available in the 2018 Toyota Highlander, you'll get five more horsepower than you get from the 2018 Hyundai Santa Fe. Not only is it more powerful, it's more efficient - it's the V6, not the standard inline-four, that achieves up to 27 highway MPG in the 2018 Toyota Highlander. 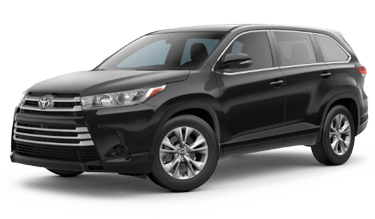 For even more fuel savings, the V6-equipped Highlander gets the Start and Stop Engine System, which turns off the engine automatically when stopped, like in a drive-thru or at a stop light, and instantly restarts the engine when you disengage the brake. It'll save you fuel, but otherwise, you'll barely notice it. Eager to spend even less on fuel while releasing fewer emissions? Be sure to check out the available 2018 Toyota Highlander Hybrid. Both vehicles in our test are designed to keep your whole family safe, and both vehicles succeed, earning Top Safety Pick recognition from the Insurance Institute for Highway Safety. However, thanks to Toyota Safety Sense™ P standard on every 2018 Toyota Highlander, you'll get more safety systems no matter what trim level you choose. Toyota Safety Sense™ equips your Highlander with dynamic radar cruise control, pre-collision system with pedestrian detection and lane keep assist. You can get similar systems on the 2018 Hyundai Santa Fe - however, they'll be pricey upgrades unless you choose the already-pricey, top-end trim level. Every new 2018 Toyota comes with modern safety systems and the Toyota reputation for durable, long-life construction. The Entune™ infotainment technology and Toyota Safety Sense™ driver assistance systems are among the finest in the business, and they come standard on virtually every brand-new Toyota. There are hundreds of places you could buy your next new car, but only at Capitol Toyota will you get "Your Way on the Parkway." That means we put you, the customer, first. You can be confident in your purchase at Capitol Toyota, our clean, comfortable showroom and our talented service technicians. Come see us today, just minutes from Keizer! We don't want merely to sell you a car - we want to earn your business for life.